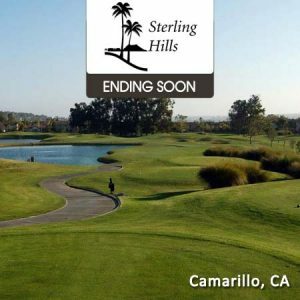 Sterling Hills Golf Club is a fun, exciting, and challenging golf course in a beautiful setting, surrounded graceful California pepper trees, majestic eucalyptus, and some of the most bucolic farmland scenery in Ventura County. Boasting the best year round weather on the California Coast, Sterling Hills offers a fun filled golf experience for players of all skill levels. Designed by Robert Muir Graves and Damian Pascuzzo. The course architects took advantage of the strong natural features of the area, with the sculpture of the course mirroring the beautiful topography. 901 Sterling Hills Dr– Map It! $69 paid value does not expire. Golf Moose (not the golf course) will honor the paid value after the expiration. Customers must contact Golf Moose for paid value credit after the promotional expiration.